This color unlike some of the other 2015 new colors, this clay was much firmer in the pack. As is typical of translucent clay, it will yellow when baked. The thicker the clay, the more yellow it will become. The picture at right shows both unbaked & baked clays. The top is the #2 thickness on my Atlas. The bottom is a #5 thickness on my Atlas. You can see the difference. The thinner the sheet, the more it is truly opal. 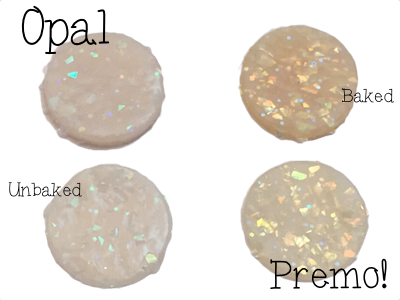 Will this clay give a true “opal” effect. I believe that it will in very thin layers. As a thick piece I do not believe it captures the true opal effects. This looks gorgeous paired with any jewel toned colors. Here’s a FREE project by syndee holt that shows how layering this in thin sheets can create an awesome effect!